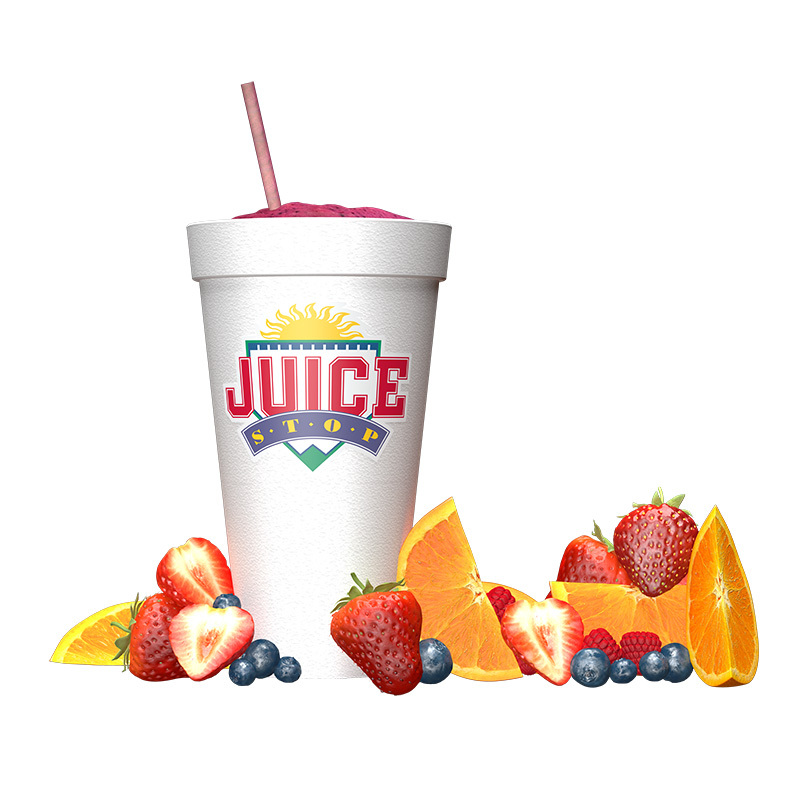 Funny, I'd always assumed Juice Stop was some kind of big chain conglomerate... until I actually went there today. It became obvious pretty quickly that this is just a good 'ol local business. I couldn't even remember my order long enough to drive 5 seconds up to the window and ask for it. So, my bad, I ended up ordering the wrong thing. What I wanted to order was the "Knock Out" - Apple, Bananas, Strawberries, Vanilla Non-fat Yogurt. But when I approached the window all I could remember was... Power... something? (And I ended up with the "Power Play" - Watermelon, Raspberries, Strawberries, Vanilla Non-fat Yogurt, Raspberry Sherbet. Raspberry sherbet isn't really something I'd normally eat at breakfast time, but it sure tastes good). This, after reading through the 49 smoothie options available (not to mention the 12 nutrient blends and 10 add-ins) and then trying to remember which one I wanted. Yes it's a bit overwhelming, but for a smoothie junkie like me this is also very exciting. So many combinations... and with a 16 oz size to compliment the behemoth 24 oz . Definitely a place I will be frequenting. Every smoothie receives one free nutrient (approx. 5 mg). Additional nutrients are $0.50 each. 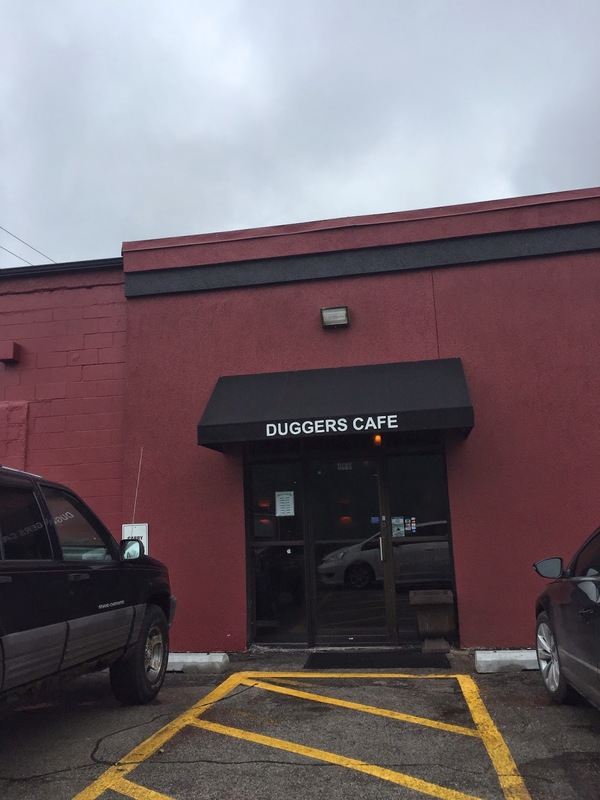 Dugger's Cafe has been open now officially all of about two weeks (I think, though a Dugger clued me into the space at the tail end of December), in the old Noodle Zoo space (RIP) next to Dundee Theater. Technically now it's the old Zephyr Lily Cafe space, but my point is, the interior is greatly unchanged, even from the NZ days. Same paint on the walls, same ceiling, lighting fixtures and even perhaps the floor. It probably goes without saying that the location is a bit odd, with no street view from either Dodge or Capitol Ave, you really need to be looking for it as a destination, even once you come upon the front door. There was something going on - or not - with the ventilation this morning, as the restaurant was actually warm and humid inside with condensation on the windows and door. But that's just me and my weird HVAC observations. There was also an 8-year old banging his silverware together over and over while his parents did nothing... the overall atmosphere reminded me more of a diner than a brunch-style cafe. But sometimes it's nice to keep it casual, eh? The owners, Jeanette Laitner, her son, Randy Dugger, and Dugger’s wife, Rhonda, have a long history in Omaha restaurants. Jeanette and her former husband, Jim Dugger, opened Duggers Coffee Shop in 1965 at 84th and Center Streets. After 10 years, they moved the shop to 80th and Center, where they stayed for another 10 years before selling the business. Randy Dugger, who graduated from the Culinary Institute of America in Hyde Park, New York, worked as a chef for 30 years with Marriott Hotels. In Omaha, he opened Farmhouse Cafe and worked there for eight years. Most recently, he worked with Patricia Catering in Bellevue. The restaurant is open for breakfast and lunch all day starting at 6am Monday-Friday and 6:30 am Saturday-Sunday. Closing time is 3pm every day. Their Facebook page is facebook.com/duggerscafe. Perusing the menu only one thing really jumped out at me... the Belgian Waffle. This prompted some serious research after the fact (and a whole separate blog post about Belgian Waffles), when I sat down to write this review. But the short version is that what showed up was not what we were hoping for. It an American Belgian waffle. Soft, round, and served with one pad of warmed butter. Looking at it now makes me sad after writing about those other waffles. The homemade 'maple' syrup was a bit confusing to me also, since it didn't appear to have any maple flavor. But this is comparing to what I'm used to at home (100% pure maple syrup). What showed up in the syrup dispenser reminded me more of corn syrup with a lot of caramel color, a la Aunt Jemima. 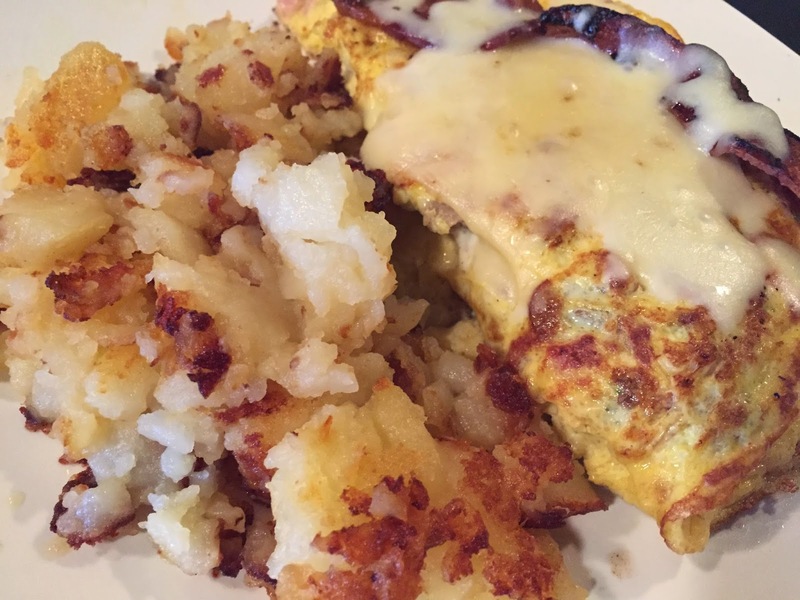 Bill had the 'Chris' Butcher Shop Omelette', with bacon, sausage, ham and jack cheese. I went for the Breakfast Croissant, with scrambled eggs, diced ham, bacon, cheese all 'nestled' in a croissant. The sandwich was okay, all the flavors were there but the whole thing was compressed a bit and pretty greasy. Flavor was very rich, and I only ate half. The fruit was probably the star of my plate, actually, with freakishly fresh strawberries taking center stage. One of the reviews on Yelp / Urbanspoon cites poor waitstaff. That wasn't our experience at all, luckily. We were greeted immediately upon entering, and seated quickly. Service was friendly and prompt. 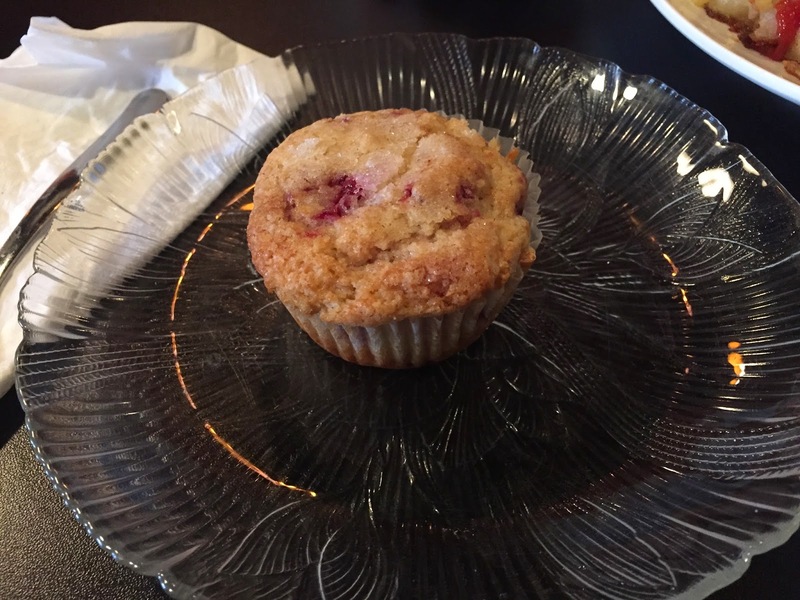 There was a brief moment of muffin-memory-lapse, but it didn't affect the speedy pace of our meal. Paying was a little confusing, as we weren't instructed to pay at the counter and just figured that out for ourselves in time. Then, the gentleman working the counter had to go get our server so we could pay her specifically. A procedure that seemed strange to me as I haven't seen it before. Maybe we were supposed to pay at the table after all? I started to hijack my own review of Dugger's this morning with this information, and then decided it was best to make a dedicated post. Waffles are an interesting topic. And admittedly not one I've gone into detail researching before. As a kid, you know the difference between a waffle and pancake because waffles hold more syrup (and peanut butter). But really, if you look into it, waffles can vary greatly depending on where you are in the world. And to make matters more complicated, apparently the types are somewhat open to interpretation. Plenty more waffle information is available on Wikipedia, if you're interested. Because this post is focusing on Belgian Waffles. What we can apparently agree on, is that "a waffle is a leavened batter or dough cooked between two plates, with a specific 'waffled' look". So a waffle has to look like a waffle. Now, I've been craving a particular type of waffle recently... The kind with a yeast-leavened dough and sugar baked right in, making them dense, caramelized, slightly chewy but still sweet and crunchy. The kind of waffle that can stand on its own and be eaten in-hand. This is the Liege Waffle. (Waffle Window in Portland knows what I'm talking about here). 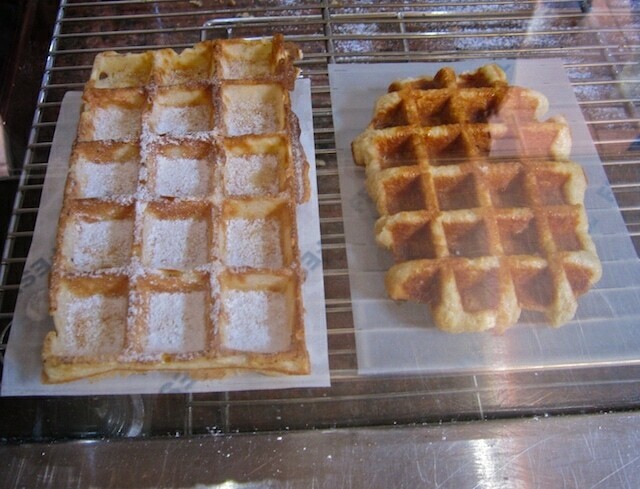 The Liege is one of the two common types of waffle available in Belgium. And it is flipping fantastic! Then there is the Brussels Waffle, the second common Belgium waffle type. They are allegedly always rectangular (where the Liege may not be) with a lighter, yet crispy texture and deeper pockets. Brussels waffles are prepared with an egg-white-leavened or yeast-leavened batter (or sometimes both). Sometimes dusted with powdered-sugar, whipped cream, fruit or chocolate spread. These and the Liege are both common 'street food' waffles. Brussels vs Liege waffles. Photo credit: Otts World. Neither of these waffle types is akin to the 'Belgian Waffle' which we really should call the 'American Belgian Waffle' since there is no such thing as a Belgian Waffle in Belgium. 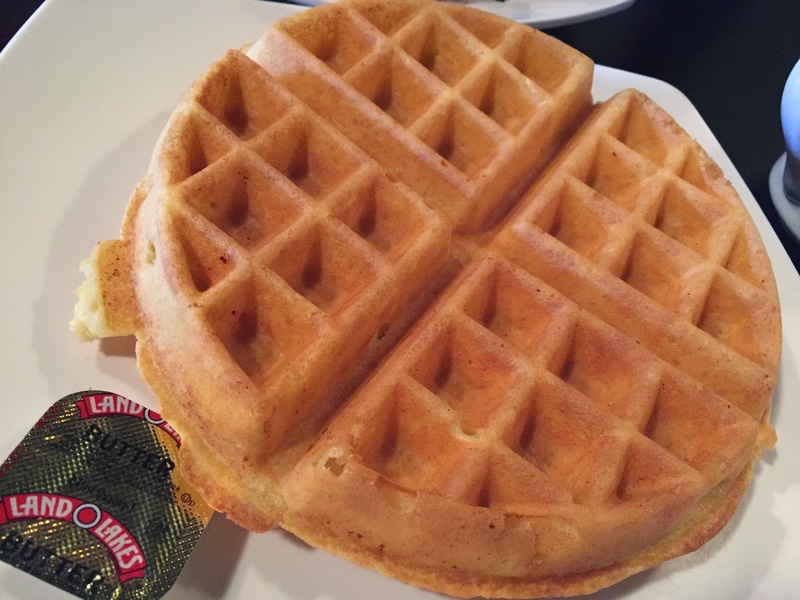 The American Belgian Waffle is a simplified recipe of the Brussels waffle. It's probably leavened with baking powder, there are no specific shape criteria, and use a yeast batter (while 'regular' American waffles could just be pancake batter cooked into in a waffled shape). So really, if you're at a restaurant in the U.S. and see 'Belgian Waffle' on the menu, there's no telling what might show up. But it most certainly is NOT going to be a Liege or Brussels waffle. Cast Iron Waffles (Westroads Mall) looks like the most promising candidate since the words 'Belgian Liege Waffles' is right in the name!!! One of only 4 locations, it's a relatively new addition to our area, but one I'm excited to check out. Probably as soon as I'm done writing this post. But who else can sling a decent waffle in town? When it comes to Chicken and Waffles, I know first-hand that both Lot 2 and Blatt Beer & Table can throw down on that topic. Taxi's: Their Gran Marnier dipped french toast might set an interesting precedent for their waffles, and I've been generally impressed with their other brunch items. 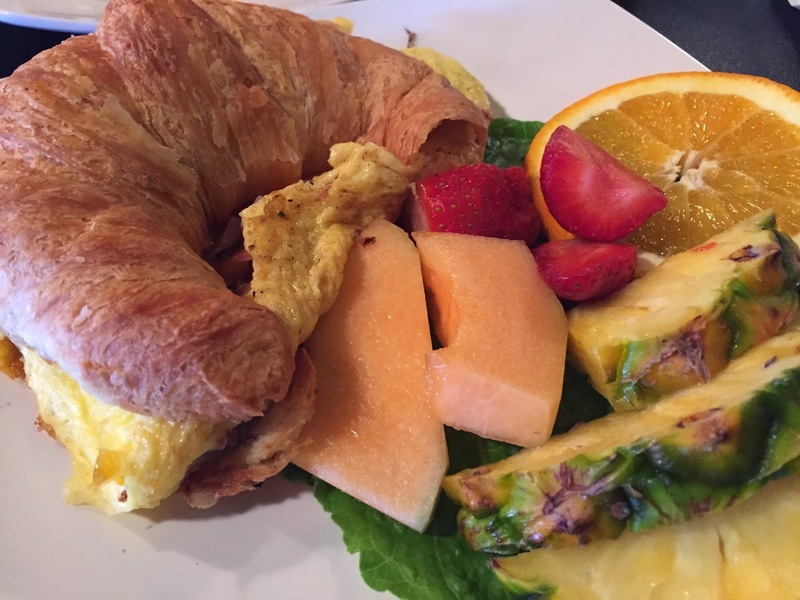 Railcar: I know their brunch is stand-out delicious. Their chicken and waffle is probably worthy of praise as well. Le Boullion: Haven't been here yet, but their 'Sunday Waffle' sounds very promising. Bailey's: One of my favorite breakfast spots. They have a 'Belgian Waffle Plate' but I'm not really optimistic about it. Good luck waffle hunters. Honestly I almost never order waffles at restaurants for this reason. You hardly ever know what's going to show up (although I suppose you could say this about anything). Anyway, I'm off to Westroads for a Liege waffle! 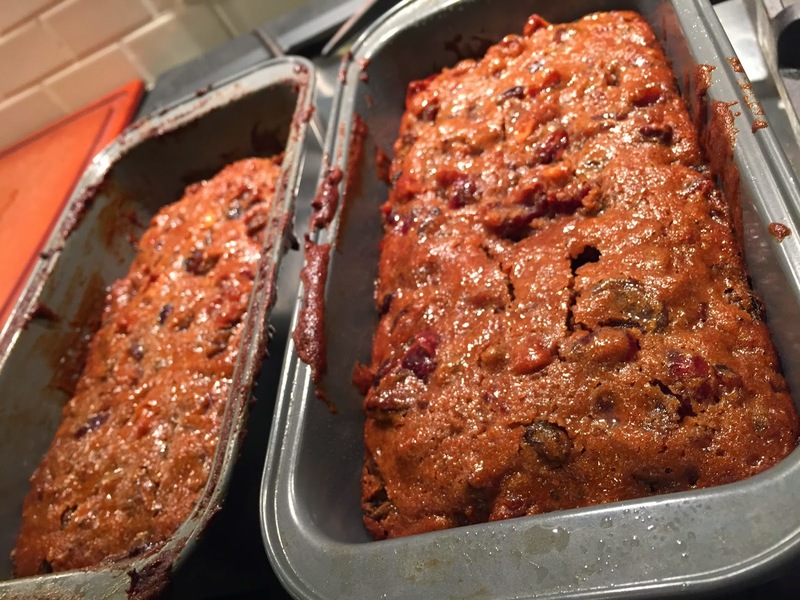 Maybe that's the English side of me, but I have nice childhood memories of Christmastime at my Grandma's house playing cards, sipping tea and eating fruitcake with hard sauce. (What can I say, I'm an old soul). 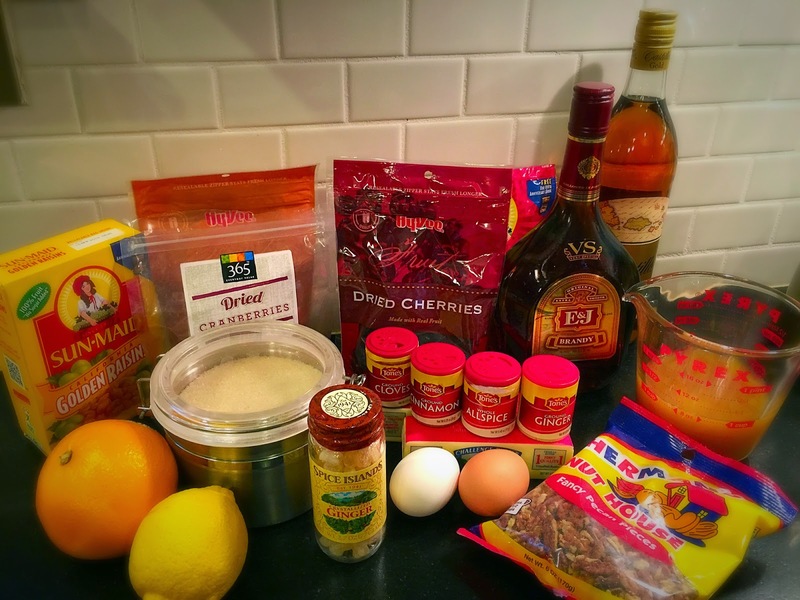 So for this year's Christmas baking project (after with last year's eggnog), I thought I'd try my hand at fruitcake. But first, some wisdom from comedian Jim Gaffigan on the topic of cake. If you're impatient, he gets to fruitcake around 4m 20s. The fruitcake joke in this video stems from the opposite view of fruitcake I have. Namely, that it's a joke. And when I told some people I was making fruitcake this season, that's a bit of the reaction I got. But for anyone who's ever had a really good fruitcake, I know you know better. 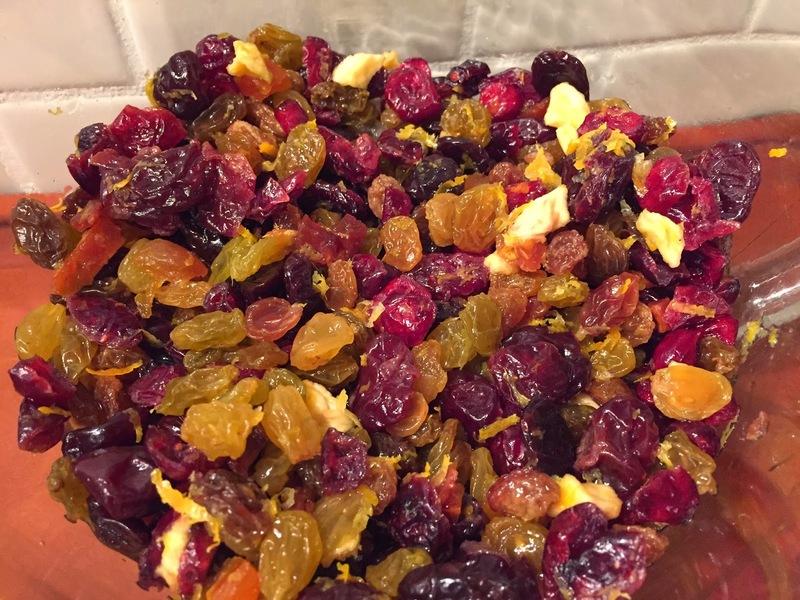 Now apparently, most American mass-produced fruit cakes are alcohol-free (lame... says the pregnant blogger). So obviously mine had to have booze in it. Unfortunately, buying alcohol - even for baking purposes - is much less fun when pregnant. (Though nobody at Hy-Vee batted an eye when I had to get a manager to pull the E&J brandy from the locked top shelf cabinet for me). 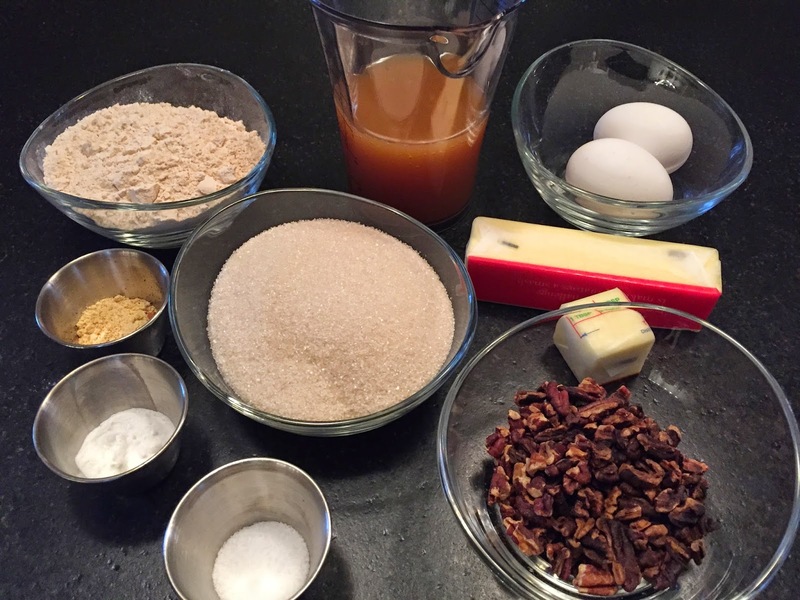 The recipe I used was Alton Brown's Freerange Fruitcake. Bonus, there's a video for that too if you follow the link! Okay, here are the ingredients. The Goods are all ready! 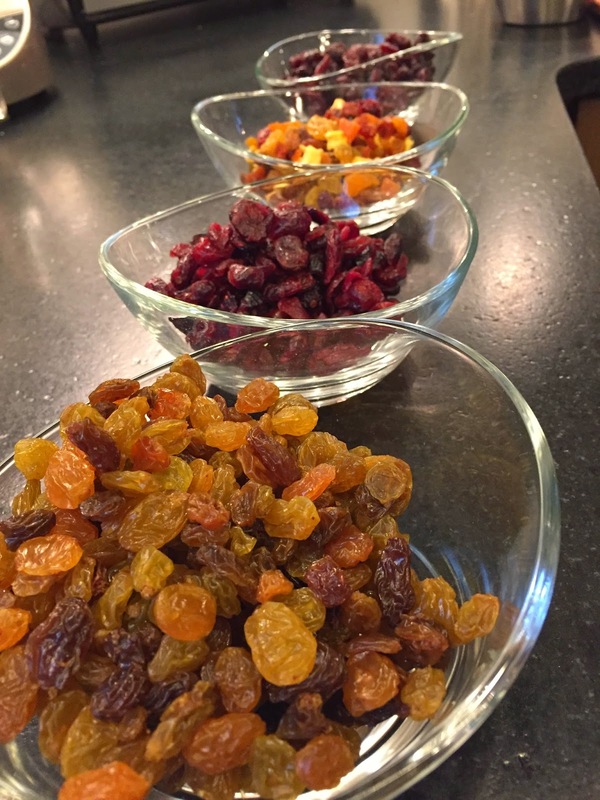 Combine dried fruits, candied ginger and both zests. 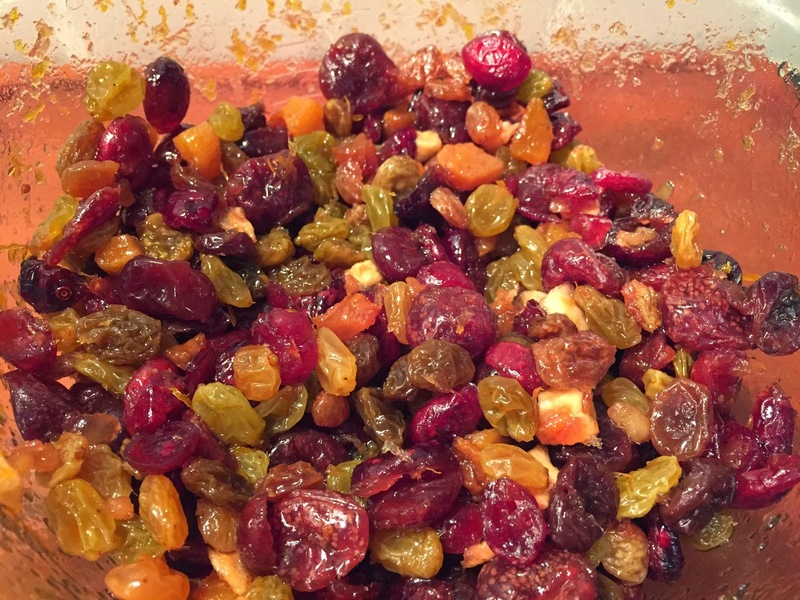 Add rum and macerate overnight, [or microwave for 5 minutes to re-hydrate fruit]. Obviously I let this stuff sit overnight. You know, to keep it traditional. It didn't really look a whole lot different before and after, honestly. But the fruits had definitely taken on a significantly boozy thickness. 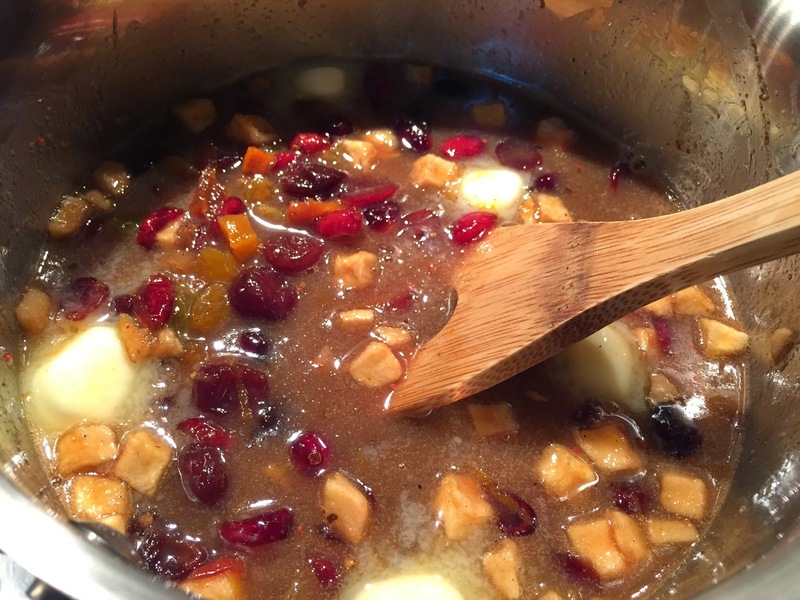 Combine dry ingredients and sift into fruit mixture. Quickly bring batter together with a large wooden spoon, then stir in eggs one at a time until completely integrated, then fold in nuts. This is when things got a little messy... literally. Spoon into a 10-inch non-stick loaf pan and bake for 1 hour. 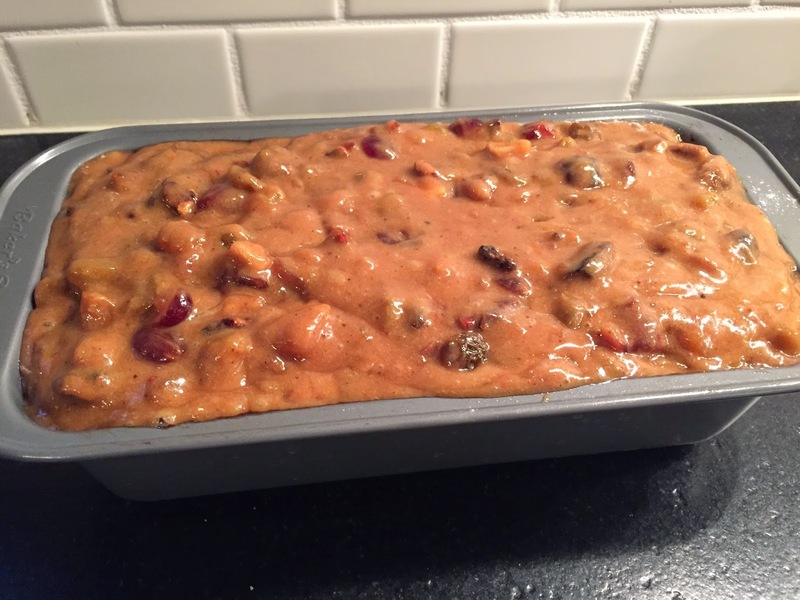 Make sure the mixture fits in the loaf pan you use. I may have added a bit more fruit than the recipe called for, and as a result ended up with this look in a single loaf pan. Ended up with two fruitcakes! Twice the fun. Check for doneness by inserting toothpick into the middle of the cake. If it comes out clean, it's done. If not, bake another 10 minutes, and check again. Remove cake from oven and place on cooling rack or trivet. Baste or spritz top with brandy and allow to cool completely before turning out from pan. Then you seal up in an airtight container and keep spritzing every 2 - 3 days with brandy throughout the holidays. You can also freeze, but these babies didn't make it through New Year's. But that's not all. There was also... The Hard Sauce. 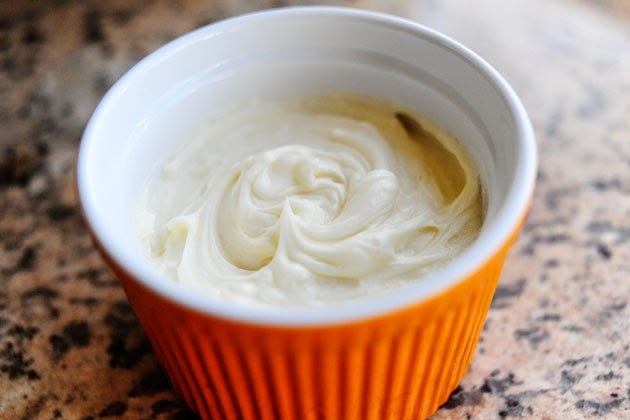 If you haven't had the pleasure, hard sauce is really easy to make and keeps for months when refrigerated. Though it is called a sauce, it's not really a liquid and when refrigerated is actually a solid. So it's technically more of a spread when you let it come up to room temperature. And it's also really tasty since it's also just sugar, butter and - yes - booze. Specifically bourbon. I used The Pioneer Woman's recipe, though you could probably half the alcohol if you're looking for less of a kick. ENJOY!